We’d love your help. Let us know what’s wrong with this preview of Rebellion by Ian Irvine. Every year the winters worsen, and the realm’s protective magic disappeared with the traitor-king, Lyf, two thousand years ago. Now Lyf is back, bent on wiping Hightspall off the map and rebuilding his ancient land anew. A slave orphaned by Lyf, Tali holds the key to saving the realm – or destroying it. Can she stop him before he tears Hightspall apart, HIGHTSPALL IS DYING. A slave orphaned by Lyf, Tali holds the key to saving the realm – or destroying it. Can she stop him before he tears Hightspall apart, and plunges the world into perpetual darkness? Rebellion is the breathtaking sequel to Ian Irvine’s fantasy epic, Vengeance. To ask other readers questions about Rebellion, please sign up. This stunning sequel surpassed all my expectations and left me in awe of Irvine’s writing and world building skills. As usual, the build up is paced slowly, but the climax speeds along, ending with a cliffhanger that will distress all readers! The rebellion that the Hightspallers stage after their the enormous defeats at the hands of the Cythonians in Vengeance forms the major plot line for this book. The world building is amazing – the cultures, values, and traditions of both peoples are well re This stunning sequel surpassed all my expectations and left me in awe of Irvine’s writing and world building skills. As usual, the build up is paced slowly, but the climax speeds along, ending with a cliffhanger that will distress all readers! The rebellion that the Hightspallers stage after their the enormous defeats at the hands of the Cythonians in Vengeance forms the major plot line for this book. The world building is amazing – the cultures, values, and traditions of both peoples are well realised and I enjoyed the story expanding to show us more of the world. Garramide, in particular, is an amazing place and vividly portrayed, and it’s importance to both sides ensures us that we will be returning there in the next book. Another setting I love is Tirnan Twil – a tower set on a cliff accessible only by five narrow arched bridges. I have always loved the amazing settings that Irvine creates in his worlds and was not disappointed in the least in Rebellion. The other plot elements are no less interesting: Lyf’s continuing struggles with gaining access to his lost king-magery, Tali’s determination to free all the slaves in Crython, the difficulties Rixion faces in regaining his honour and will to live. I’m still invested in Lyf and sympathise with him, even though he’s the enemy (or is he?). While the plot elements are woven in skilfully amongst the action and intrigue, I feel the novel is needlessly long. Irvine is never one to use one word when ten will suffice, but I found myself taking a lot of breaks while reading Rebellion because the action unfolded a tad too slowly for my liking. This is the only real negative point I have to make about it. The main characters continue to grow and learn throughout the novel, and I was impressed with Rixion in particular. The death of his parents and the ruination of his House really matured him up, and although he still made mistakes, it’s obvious how much he has changed from the moment he arrives at Garramide. Although his trusting nature gets him into trouble a few times, I hope that the war and its consequences don’t rob him of his goodness. Tali also grew admirably, discovering her strengths and finding courage inside herself to do what needs to be done. Rebellion also introduces us to a host of new characters, my favourite of which has to be the mysterious Holm. He is written as the archetypal old-guy-who-knows-everything and rather conveniently meets Tali just as she needs guidance with her magic, but he proves to be an intriguing character none-the-less. 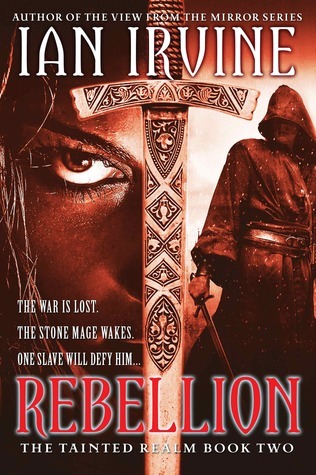 Rebellion is a great book that builds upon the foundations that Vengeance laid out beautifully, and I recommend the series for fans of Irvine’s works and those who enjoy epic fantasy. One of the greatest things about all of Irvine’s works is that they stay away from the overused ‘swords and sorcery’ tropes. I am looking forward to reading the conclusion to this series, Justice, next year. Rebellion follows directly on from Vengeance and while there's a solid 'previously in the Tainted Realms' preface this is not a book you'll get the best out of if you've not read Vengeance first. If you're reading this review (and therefore have at least a passing interest in heroic fantasy) then you should pick up Vengeance if you haven't as yet. Believe me you wont be disappointed. Rebellion features more absolutely stunning imagery, which somehow reaches greater heights than its predecessor, solid character development and some fascinating new threads and plot twists. The good guys aren't entirely good and the bad guys have qualities you can admire and agendas you can sympathise, even agree with, even as you hate them for being bad. The main characters grow and change through (some)good fortune and (lots of) adversity becoming more fully realised and rounded, all set against a dark tapestry which weaves itself around them in epic majesty. While on the subject of character development I believe Ian (if he'll forgive the familiar use of his first name) takes positive delight in giving his heroes a hard time, and I'm sure if he'd written The Odyssey poor Odysseus would have finally got home not a whole man at all! Its clearly meant to make us to get behind the characters. For me it certainly worked, and I have further come to believe that 'all great things come at a price' is a theme Ian likes to explore in his writing. For eveything that happens there's very little by way of padding, the story is very clearly going somewhere and does it at a cracking pace, rising through a series of crescendos to a satisfying climax which still leaves you wanting more, a good thing since there's another book to come. Nonetheless, Rebellion isn't flawless for me. There's the odd thing that happens here and there that grates a little, and some of the supporting characters are a little unidimensional, while others are drawn so large that they're almost manga-esque in their depiction and actions. While this is clearly a stylistic choice, meant to contrast with his more rounded, earthly depiction of the heroes, its not one I am entirely comfortable with, but I'm certainly intrigued and want to see where it leads. This however is a small criticism of a great piece of writing which avoids many of the clichés driving our genre and 28 books in Ian Irvine remains fresh, vibrant and original, a feat which many of his colleagues have failed to emulate. After the almost obligatory cliff-hanger I was left shaking my fist at the sky, yelling 'damn you Irvine! Damn you to hell!' but I definitely want more and will be waiting at the head of the line for the next audio publication (and yes I'll be buying the book as well). So...should you buy this book? Damn right you should! Rush out and order it now! For those of you who click on the 'read more' button, the plot thickens a little because this is a review of the audiobook. We can't get hold of the actual novel here in the UK for a while yet. As such I've taken the liberty of reviewing both the book and the audio here. The audiobook I listened to was however unabridged and thus I stand behind my review as valid critique the book. I had a real problem at the start of Vengeance. This has more to do with the way the story proper begins as opposed to the reading by Grant Cartwight. The young Taali didn't entirely convince me on the page, nor was I convinced as I listened, in part because of the reader's Australian accent. However I am glad I got through that part because not to would have done both the books and this reading of them a grave injustice. Grant Carwright is an excellent voice actor. Each character (and there are lots) is distinct and instantly recognizable, and his reading is both clear and engaging. If he wasn't as involved in the story as I was he should be winning oscars because he certainly seemed to be! So for me Grant (if he'll also forgive the familiar use of his first name) has become the voice of the Tainted Realms. He's added to my experience of the story and he had better be the voice of book 3. It, like the first book, has a lot going for it (worldbuilding and characters are good), but there's just something in how it all fits together, and the amount of leaps of intuition/knowledge among characters etc that just makes me never really engage with the characters and story, which is a pity. Ok there is only 1 thing I have to say about this book. PLEASE! OH PLEASE DON'T KILL TOBRY! HE IS YOUR FRIEND! 3.5 stars. Didnt enjoy as much as the first, and some of the characters traits and plot lines didnt flow as smoothly as I thought they could. I was happy to see Rix mature and develop, and the relationships between characters also grow. Rebellion is the second book in the Tainted Realm Trilogy, and continues the story of a dying land torn apart by vengeful war. The first novel, Vengeance, was chock full of anticipation, action, and emotional twists and turns. Irvine does not disappoint in this follow up installment. Tali is the first slave to escape from underground Cython since her ancestors were taken in exchange for a ransom that was never paid. The Cythonians, now at war with Hightspall, are strict and brutal masters. Tali h Rebellion is the second book in the Tainted Realm Trilogy, and continues the story of a dying land torn apart by vengeful war. The first novel, Vengeance, was chock full of anticipation, action, and emotional twists and turns. Irvine does not disappoint in this follow up installment. Tali is the first slave to escape from underground Cython since her ancestors were taken in exchange for a ransom that was never paid. The Cythonians, now at war with Hightspall, are strict and brutal masters. Tali has sworn to free her people, all eighty-five thousand of them, but with Hightspall losing the war and their leader, Lyf, still hunting her for her master pearl, how can she even think of doing that? Rix, meanwhile, is also on the run from Lyf and his forces. His enchanted blade, Maloch, is pulling him towards an unknown destiny. Maloch might have the ability to awaken something from the depths that will change the war, and the world, forever. Rix, Tali, and the rest of the cast from Vengeance are as three-dimensional and imperfect as ever. Ian Irvine does a magnificent job of making the reader relate to each of them. Rix remains haunted by his betrayal of his family and their subsequent downfall. Despite being a leader of epic abilities, his self-doubts and lack of confidence make him seem like a real person, a friend with real life baggage. Tali, too, has moments of brilliance that are shadowed by her fears and occasional over-confidence. Blundering into unforeseen errors and doing the best you can by those you love -- these things are part of the human condition, displayed in a believable and touching fashion. The theme of setting as character continues as well. We learn about the engine at the heart of the world -- what is it? How does it relate to the terrible things happening in the land? The Pale have been enslaved for thousands of years. How will they react to the possibility of freedom, even if the alternative is death? What about those with the madness of the caitsthe bearing down on them; how does a person come to terms with that? These are but a few of the questions you can wonder about as the author digs into the heart of both the darkness and light inside humanity. The real coup de grace that makes this novel masterful, though, is the nonstop action. It's nearly impossible to put down. Like George R.R. Martin in his Song of Ice and Fire series, Ian Irvine likes to switch viewpoints, trying to keep the story in timeline order. Unlike in Martin's work, however, I never resented the switch. Holding onto the seat wasn't just reserved for the end of each chapter. Every story line is immersive, and almost immediately to boot. The hunt for the catalyst to heal the land, the secrets of king magery, the nearly impossible situations characters have to climb out of, and the unfortunate fighting among many with the same goals -- these events are threaded together to create a thrilling race to the climax. This series so far has been an example of contemporary epic fantasy done right. Brilliantly timed action, deep characterization, and fascinating concept; the ability to make a reader's heart race through most of the story; Irvine's clear love of his craft showing through. What more could a reader ask for? Ok so straight up, I loved it. An absolutely brilliant sequel to Vengence. Irvine continues to astound me with his ability to build tension. I'll try not to spoil the book too much if you havn't read it yet. In the first book we saw great world and character development and a start to the main plot which is picked up smoothly here and develops it brilliantly. Plenty of page turning, edge-of-your-seat action that will keep you attention far as long as you can keep you eyes open or you finish it. W Ok so straight up, I loved it. An absolutely brilliant sequel to Vengence. Irvine continues to astound me with his ability to build tension. I'll try not to spoil the book too much if you havn't read it yet. Which brings me to the conclusion itself. Not so much a conclusion as it is an outstanding cliffhanger. The only other cliffhanger that left me wanting every little bit more was 'The Daylight War' by P.V. Brett. But thats for another review. I love my fantasy. No doubt about it. And this is up there on my list of favorit books. Why? Simple. It's just so well writen. I have no problems with the book. All the events flow so seemlessly together that i loose my self into Irvines world. Epic fantasy with an opening line that includes a character saying, "you gotta get up". Ends on a cliffhanger to end all cliffhangers, leaving me with the feeling that the choice of ending was entirely mercenary. Well-written meaty dark fantasy in between, with occasional lapses, as far as I was concerned, into modern phrasing and some odd name choices. Should be four stars, but I can only give it three. Nonetheless, a good, gripping read with some very good characters among the cast. ‘Rebellion’ by Ian Irvine is the second in his ‘Tainted Realm’. Somehow I enjoyed this more than the first. It slowly builds with climax making the ending more brutal. What I enjoy about this series is its complexity and its unpredictability. You just don't know what will happen next. Can't wait to read the 3rd one, Justice, but I also don't want it to end! I'm a bit late in writing a review - can't quite remember it, but the story and writing style from Book 1 continued and it was incredible. The charecters were very well discribed and created, and the scenery descriptions were amazing. I'm fairly sure Rebellion featured in my dreams. As usual Mr Irvine does not disappoint . His world building skills, narration and attention to detail draws you in and leaves you wondering what happens next. I would advise anyone reading this to read Vengeance first. Imaginative writing as always . I really liked everything except the ending! Now I have to find the sequel, Justice, to see if it makes up for it. Beautifully written. The books make you feel like you are there(even though it is not real) and to care what happens to the characters. I feel like this book lost its way a bit. The story is getting a bit too convoluted. I'm hoping the third book bounces back. Thoroughly enjoyed this 2nd book. The situation seems so desperate. As soon as I finished I rushed out to get the next one. I'm an Australian author of 32 novels, mainly fantasy. They include the bestselling Three Worlds epic fantasy sequence, which has sold over a million print copies. It comprises The View from the Mirror quartet, The Well of Echoes quartet and The Song of the Tears trilogy. I’m currently writing The Gates of Good and Evil, the long-awaited sequel to The View from the Mirror. 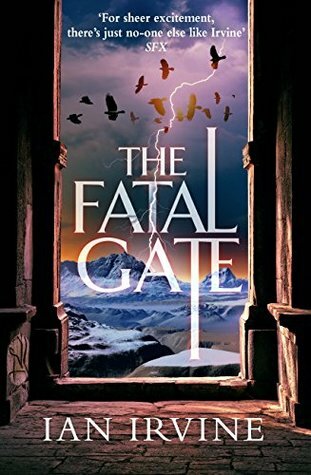 Book 2, The Fatal Gate, I'm an Australian author of 32 novels, mainly fantasy. They include the bestselling Three Worlds epic fantasy sequence, which has sold over a million print copies. It comprises The View from the Mirror quartet, The Well of Echoes quartet and The Song of the Tears trilogy. I’m currently writing The Gates of Good and Evil, the long-awaited sequel to The View from the Mirror. Book 2, The Fatal Gate, was published worldwide by Hachette on June 27, 2017. Funny thing is, I never wanted to be a writer. From an early age my ambition was to be a scientist. I’m an expert in pollution and I’ve spent my professional life studying it in far-flung places like Mauritius, Sumatra, Mongolia, South Korea, the Philippines, Papua-New Guinea and Western Samoa, as well as all over Australia. Often scuba diving to the bottom of foul, smelly harbours and hammering tubes deep into the polluted mud to collect samples for chemical analysis. Now that’s living! I was a small, quiet kid who devoured books from the moment I learned to read. When I was naughty, Mum wouldn’t let me read anything for a week – talk about a cruel and unusual punishment. I discovered fantasy in the early 70’s, with The Lord of the Rings and the Earthsea trilogy, and was immediately hooked. But there wasn’t much fantasy in those days; within a couple of years I’d read everything available. I wanted more and bigger tales, on vaster canvases, but they didn’t exist. That’s why I had to become a writer – to write the kind of stories I wanted to read. I’ve never wanted to write about superheroes or huge, reckless warriors who know no fear. I write epic fantasy about underdogs and ordinary people who, in pursuit of their goals, are put to the limit of human endurance. My characters aren’t fantasy stereotypes, they’re real people with believable motivations and unfortunate flaws. I’m well known for strong female characters who have as many adventures as the men, and frequently get them out of trouble (I have five sisters). My characters are often small or clumsy or inexperienced or handicapped in some way, yet they make up for it with cleverness, ingenuity or sheer, low cunning. My antagonists are real, complex people who do bad things for strong and deeply-held reasons – never ‘just because they’re evil’. Though my characters suffer every kind of torment imaginable, at their lowest point they discover the truest form of courage – they keep fighting because the fate of the people they care for, and the world they love, depends on them never giving up.